We have collected and analysed 36 expert reviews and 208 user reviews from international sources. Experts rate this product 84/100 and users rate it 93/100. The average review date is 24-11-2017. We have compared these reviews to 6376 reviews from other Drones. The alaScore™ for this product is 95/100 = Excellent. Last update: 18-04-2019. DJI Spark review: DJI's gesture-controlled drone is incredibly fun to fly with lots of automated modes that make it a great first advanced drone. No larger or heavier than a can of soda, the DJI Spark is the portable drone you’ve been waiting for. Its automatic flight capabilities and ability to recognize hand gestures outshine its few problems. A review of the DJI Spark, which raises the bar again for consumer drones. You can almost fit this one in your pocket but it's as smart as the best. The Spark may be one of DJI's cheaper drones, but a relatively short flight time may leave hobbyists wanting more. For what the DJi Spark is designed to do, it is punching way above its weight class. Small, smart, but not perfect. 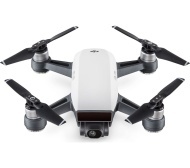 Flight time too short ; Software hides key features ; Panorama and shallow focus need work ; Base price should include propeller guards ; Quickshots needs refinement to keep the drone from flying too far away. The DJI Spark drone has so many things going for it, but it needs longer flight time, a better base package, and software polish before we can recommend it.